Due to the various storms, threats, violence and chaos happening in our world, it’s up to the Church to make a difference. That means you. It’s easier than you may think. We don’t have to look far to be the difference in the world around us. The times are showing us that our world needs us. If not us then who? If not now then when? 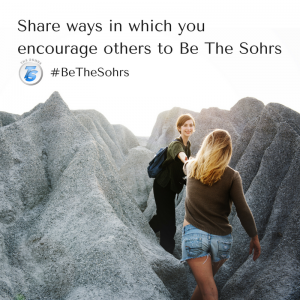 This week’s #BeTheSohrs focus is “Share ways in which you encourage others to Be The Sohrs!” It’s our time to do what only we, Christians can do. It’s time to be the difference. It’s time to BeTheSohrs!